Note: These books are by Doug Stark. Dave Stuart Jr., who teaches down the hallway from Doug and can't imagine teaching an English course without Doug's warm-ups, is acting as the publisher. Welcome to Mechanics Instruction that Sticks 3.0, a series of writing warm-ups that can help your students master the conventions of the English language without drilling them or overstressing you. This latest version adds consistency in style and formatting across all levels, as well as an all-new Level D book. Best of all, we're thrilled to share that every level now includes a quiz for each unit -- ideal for formative or summative assessments. This much-requested feature makes it likely that Mechanics Instruction that Sticks 3.0 will be the only resource you need for attacking mechanics in your classroom or as a vertical secondary team. NEW: Level A now includes one quiz per unit (13 total quizzes), plus an extra quiz on common word errors. To see how Level A compares to the other books, use this handy chart. To read Doug's brief explanation of how they fit together, click here. NEW: Level B now includes one quiz per unit (13 total quizzes). To see how Level B compares to the other books, use this handy chart. To read Doug's brief explanation of how they fit together, click here. To see how Level C compares to the other books, use this handy chart. To read Doug's brief explanation of how they fit together, click here. Doug created Level D to give teachers an option for older students (10th grade and up) who need to focus more on style and less on mechanics and grammar. 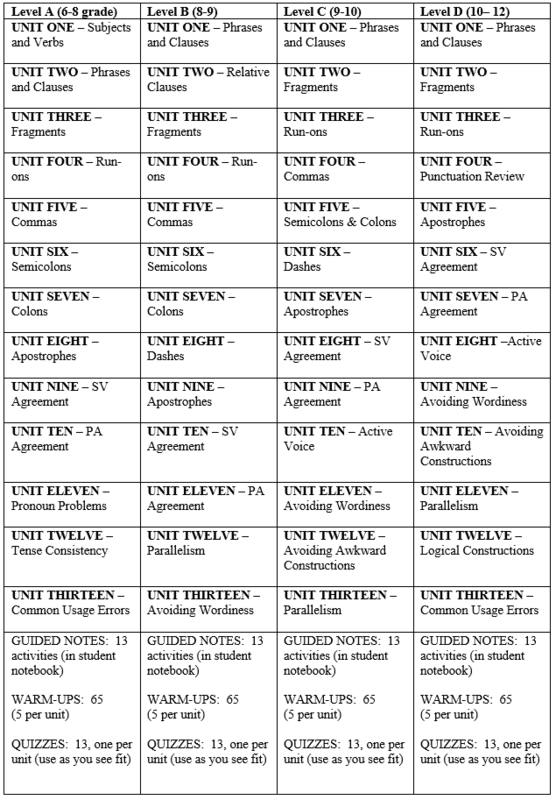 The units in the Level D book (i.e., avoiding wordiness, avoiding awkward constructions, using active voice) drive home the need for clarity and precision in writing. Level D includes one quiz per unit (13 total quizzes). To see how Level D compares to the other books, use this handy chart. To read Doug's brief explanation of how they fit together, click here. How do I decide which book is right for me? This chart will give you a general idea of what is covered at each level. Notice that many of the units overlap from grade level to grade level. Generally speaking, the Level A book includes more direct grammar instruction, the Level B book focuses more heavily on punctuation and usage, the Level C book emphasizes punctuation and clarity, and the Level D book concentrates on clarity and precision. Doug used the grade level expectations provided by the Common Core Standards (Language Progressive Skills by Grade) to make some determinations about unit alignment. Their grade level standards assume mastery of most of the punctuation and usage rules prior to middle school. However, Doug's experience suggests that most ninth grade students still need direct instruction (often times very explicit instruction) in these areas. "We love your material! I've introduced it to many other teachers in our district, and they absolutely love it also. It's hard to find something that all teachers agree on, but those that I work with agree that MITS is wonderful!" "It covers the skills my kids need to prepare for the SAT. It's adaptable – I can control the pacing of notes and practice. It's CORRECT – many programs are not. The grammar instruction applies to punctuation use immediately. I love it. It's the closest thing to what I'd develop myself if I had the time." "My kids are taking ACT prep tests and have said how much this methodical study of the language conventions has helped get higher scores... [I]t's been fun to see them actually like doing this work – they see the payoff... I've seen good growth in their writing as they have learned to proofread better; they have a firmer idea of what to look for." "I want to thank you from the bottom of my heart... because this is exactly what I've been looking for... I have never put it all together as neatly and succinctly as [this]. Thank you for making this available to us. I shared the work with the LA teacher on the other team, and she almost immediately downloaded the book as well!" "These exercises are perfect to help students who haven't been exposed to any significant mechanics instruction since grade school. The repetition of key ideas works very well." "I purchased Doug's book and just looking at it, I am hearing angels in the background. This is exactly what I was looking for!" "I loved reading Doug's process of making these and then teaching and refining them." "Our whole department has been using it for the past nine weeks, and I think it's the perfect amount of time on each topic"
"I have loved this program. The explanations and repetition help the kids. I have shared my excitement with this program with many colleagues. Thank you." "It is sticking! My students do not complain about all of the repetition – in fact, it is helping many of my struggling students feel very successful." "I love the progression of the skills; the lessons are as my adult education students put it "bite size". It's easy to incorporate the sentence structure into their assignment. The unit opener page is an easy reference that is simple for them to use and is not middle school-ish." We don't have the staffing to field or fulfill bulk pricing inquiries. However, we think we've priced the books affordably -- $25 for 1 teacher to use with unlimited students. Also, please note that there are discounts when you order multiple levels at the same time: Pick 3 = $20 off, All 4 = $30 off. Yes. Start the process by emailing me at support_at_davestuartjr.com. How do I use the warm-ups? On Dave's blog, we have published the Introduction to Mechanics Instruction that Sticks. Click here, and scroll down to "How to Use the Warm-Ups." Doug also wrote a follow up piece with more advice here. When do you have time to put these together? Our school has a policy for research and publishing that we comply with. This is why Doug puts these together during the summertime from the comfort of his home. MITS is prepared without the use of district resources, and our district's employees get free access to any of the MITS products. We have a simple guarantee policy: if you're not happy, email us (support_at_davestuartjr.com), and we'll immediately give you a refund. The Number One Thing we don't want to happen is for any teacher to feel like they did not get more than their money's worth with these warm-ups. Please: If you're not happy, send us a message. Give Doug a line in the credits. These warm-ups are what they are because Doug has tweaked them for years. With that said, we realize that we may have had blind spots in creating this book, so we'd be happy to hear from you. Email Doug at doug.stark1974_at_gmail.com. What if I want to edit the warm-ups or student notebook? Although we think the warm-ups are pretty versatile as is, we've included an editable (.doc) version of the warm-ups and student notebook as well.